KWIKDRY is a water-repellent, biodegradable treatment obtained by means of innovative techniques and equipments, through a manufacturing cycle by immersion. This treatment was implemented by Cotto Furnò with the aim to satisfy their customers while respecting the environment. The treatment is invisible and permanent, it does not create a film surface and it allows the natural transpiration of the flooring. The solution used for the treatment is odourless, colourless, totally non-toxic being a water-based, solvent-free solution. The main advantage of the treatment consists in a deep and permanent protection against efflorescence. 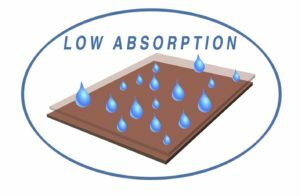 It dramatically reduces the level of absorbency of the surface avoiding the rising damp and protecting the tiles during the laying and sealing phases. Resistance to alkaline solutions and deterioration.